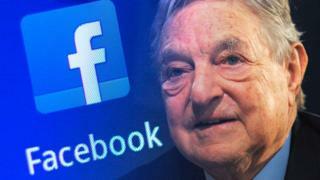 One of George Soros’s lieutenants has called on US politicians to probe Facebook, after the social network confirmed that it had hired a PR firm to make claims about the financier. In it, he confirmed Facebook had directed the PR firm Definers to investigate Soros’s links to the Freedom from Facebook campaign, which is seeking the company’s break-up. 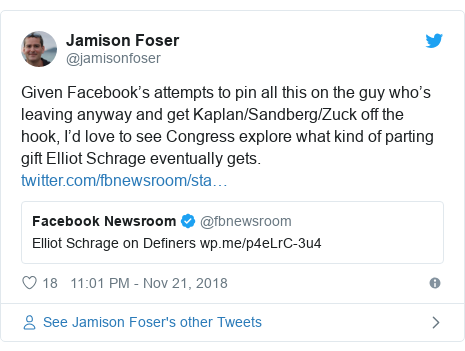 Mr Schrage added that related documents were then sent to journalists on Facebook’s behalf. 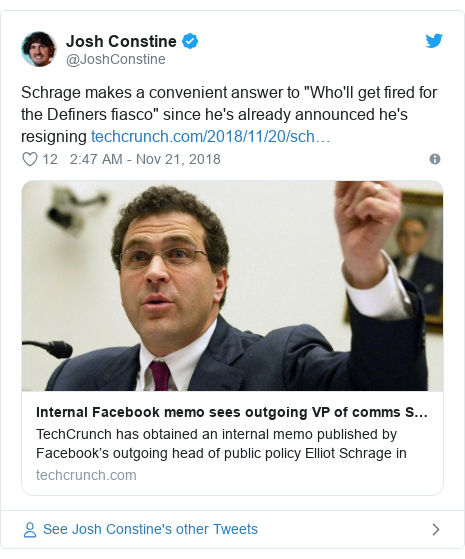 The memo had originally been sent to Facebook’s staff and had already been leaked to the news site Techcrunch . 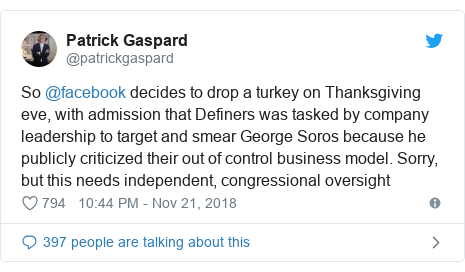 Patrick Gaspard, president of Mr Soros’s Open Society Foundations, responded by calling for an official investigation, and suggested that Facebook had deliberately timed the revelation to coincide with the US Thanksgiving holiday. In addition to publishing Mr Schrage’s message, Facebook also issued an update from its chief operating officer Sheryl Sandberg. 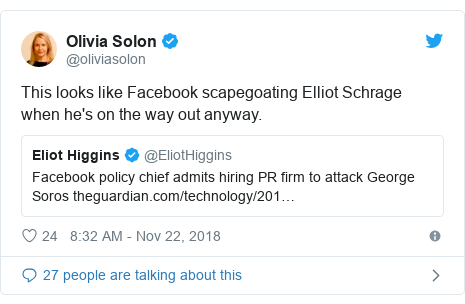 A week ago, she wrote written that she had not known that Facebook had hired Definers, the PR firm involved, nor knew about the work it had done on her company’s behalf. Chief executive Mark Zuckerberg had also described both himself and his deputy as having been kept “out of the loop”. “Last week, I didn’t remember a firm called Definers,” she wrote. “It was never anyone’s intention to play into an anti-Semitic narrative against Mr Soros or anyone else. Being Jewish is a core part of who I am and our company stands firmly against hate,” she wrote. Some company-watchers have suggested that Facebook’s decision to publish the memo marks an attempt to protect Ms Sandberg. She had reportedly angered “many people” within her firm by attempting to distance herself from the controversy, according to an earlier report by the Wall Street Journal, which said she had a reputation for closely managing Facebook’s media strategies. He said that his team had only asked Definers to look into Mr Soros after the billionaire had described the social network as being a “menace to society”. And although he acknowledged that he “should have known of the decision to expand [Definers’] mandate,” he did not address specifically how he thought the PR firm had overstepped the mark. “I’m deeply disappointed that so much internal discussion and finger pointing has become public,” Mr Schrage wrote. The report alleges that Definers promoted the idea that Tim Cook might seek to become US President in 2020, which the newspaper suggested had been done to undermine the Apple chief executive’s relationship with President Trump. The NYT did, however, publish a statement from Definers saying its work was “absolutely no different than what public affairs firms do every day for their clients across industries and issues across the country”.